Through the Darkness, With Love - Vol. 1 by Sandeep N. Tripathi is a collection of poems that speaks about life and emotions in general. The poet's observations and views on life and his surroundings have been expressed in a very aesthetic way, giving readers a good perspective on his thinking and his views on life and love. Through his poetry, the poet takes readers to another dimension of life, and encourages them to understand that what lies beneath the surface of what we see and what we think is the real thing. The world of aestheticism he creates with his poetry is encouraging and it transports readers into a world of creativity. The poems revolve around everyday happenings and the author glorifies the daily beauty and awesome elements of every day of our lives. Every poem in the collection has its own appeal and will make readers look at their surroundings and life with a new outlook. It will make them more observant of what is happening in their lives. The style of writing is descriptive and I enjoyed the rhyming poems a lot. The poet gives good rhythm and a lyrical quality to the poems. The last poem in the book - 'About Life' - is perfect and, as the author mentions, life goes on and he motivates and encourages readers to walk the journey of life with self-respect. Once they read this book, readers will be eager to know what the author is going to share with them in the next volume. 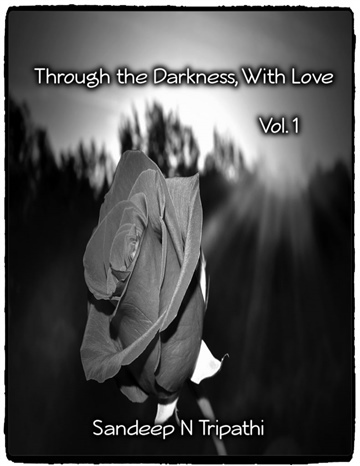 Through the Darkness, With Love - Vol. 1 by Sandeep N. Tripathi is a collection of poems about love, heartbreak, and life in general. Through the Darkness, With Love - Vol. 1 has been written over many years and indeed contains a mix of poetry from poems on youthful love and infatuation, heartache, betrayal, sadness, to a mature acceptance of life and everything that it brings with it. The emphasis on most of the poetry in this book is on romantic love and heartbreak, with life lessons thrown in between with powerful titles such as Headless and Heartless, Stormy Evening, and The Sleeping Stranger. This is a fairly short collection of poems and can be read in any order. Through the Darkness, With Love - Vol. 1 by Sandeep N. Tripathi contains a good set of poems revolving around a central theme of lost love and heartache. The writing comes across as simple and genuine with no artificial frills. It seems to come from the heart. Although the main theme of the poems is love, there is also an underlying element of life and the philosophy that everything that happens in life is simply meant to happen, and that is just how it is. One can also sense sometimes that the poems were written at different time periods because the subject matter varies from the love of the very young to the mature. Overall, Through the Darkness, With Love - Vol. 1 by Sandeep N. Tripathi is a good read for people who are poetry fans.